When using a very narrow IF filter, frequency modulation may instantaneously deviate a received signal beyond the IF passband. This causes no problem for strong signals with high S/N. But when S/N is low, channel noise may override the residual signal on waveform peaks and yield a detected waveform with noisy tips. This is the audio output waveform from a Technics ST-9030 tuner for a very weak signal with 1 kHz monophonic modulation deviated 75 kHz. Left is for the wide IF filter, which consists of two Murata 280 kHz ceramics. Right is for narrow, two 110s cascaded with a 150. 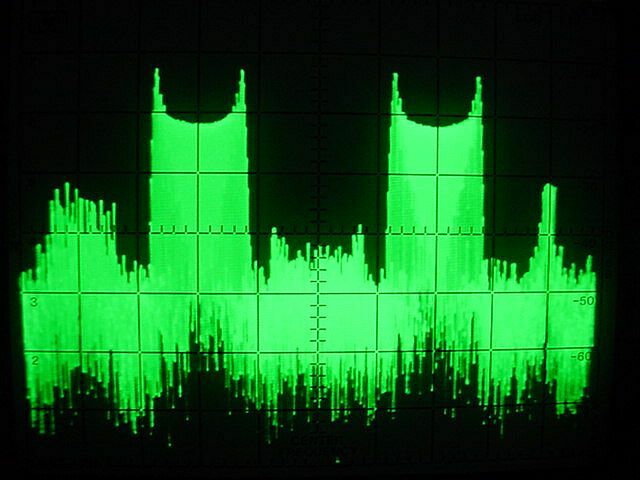 This compares wide and narrow audio spectra to 5 kHz. Not only does distortion rise, but the noise floor increases about 30 dB in narrow. This is the narrow-IF audio spectrum at an RF signal level of 24 dBf. The left image is for no modulation. Right is for 1 kHz deviated 75 kHz. Modulation increases the noise floor 30–40 dB. The slope of the modulation-induced noise spectrum suggests that it is flat before deemphasis. This is unlike the ordinary channel noise on the left, which rises 6 dB per octave before deemphasis starts to flatten it around 2 kHz. Modulation-induced noise was clearly audible on the sinewave test signal at 24 dBf shown above. I then used an RF attenuator to listen to several broadcast signals, all the way from compressed pop to wide dynamic range classical music and speech. At signal levels well below 24 dBf, I could hear no difference in sound quality between wide and narrow. Only for extremely weak signals could I begin to hear modulation noise, which made the audio sound scratchy. I think this result is probably due to the low density of waveform peaks in ordinary program material compared with sine waves, as well as to the masking effect of wideband spectra on noise. Based on these tests, I think modulation-induced noise need concern only DXers. I compared modulation-induced noise for a Sangean HDT-1, which uses an adaptive DSP IF filter, and the Technics ST-9030. I modulated a 96.9 MHz signal with 1 kHz at 75 kHz deviation and set the RF level at 22.1 dBf. I added 48.4 dBf signals at 96.7 and 97.1 MHz, both modulated with 1 kHz at 75 kHz deviation, to induce the HDT-1's adaptive IF filter to narrow. I set the RF level just below where the interferers affected the HDT-1. The HDT-1 output is shown on the left, while the ST-9030 is on the right. This compares the audio output spectra of the two tuners. The difference in background noise level is about 40 dB. THD is 0.11% for the HDT-1 and 9.1% for the ST-9030. This shows the RF spectrum of the test signal. The signals at the edges are local broadcast stations leaking into the test setup. The tuner comparison is somewhat misleading. I set the various RF levels right where the HDT-1 exhibited clean output. Had I changed them slightly, the HDT-1 would have shown a sudden rise in modulation-induced noise, while the ST-9030 output would have degraded only incrementally. On the other hand, when I tried setting the interferer levels much higher, some modulation noise became visible in the HDT-1 output but the ST-9030 trace was obliterated by adjacent-channel interference. It is tricky to compare two tuners with such radically different IF systems.